The tips below can help prepare you emotionally for the purge, and to execute it mercilessly so that you’re left with that 20% of clothing and accessories that you do love to wear. Keep in mind when purging that clothing is best kept out of the trash. Donating and selling clothing are great options and retailers like H&M and American Eagle have textile recycling programs you can take advantage of. As we’ve written before, we’re big fans of timed decluttering sessions to help organize your home. The 15 minute durations we’ve suggested when you’re short on time isn’t a hard and fast rule. Choose a number that works for your schedule and use that. If, however, you can spare the time, consider starting with a clean slate and decluttering in one extended session instead of many. Empty your closet entirely so you can better evaluate each item of clothing and decide whether you’re keeping it or not. 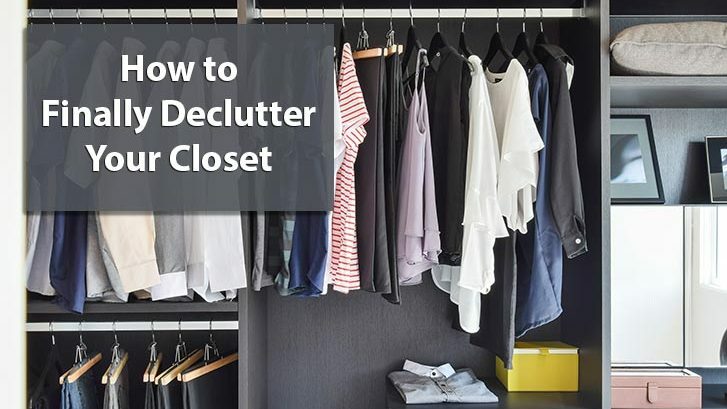 Those of you who’ve amassed a large collection of clothes might be better off tackling the clutter section by section so the task is not overwhelming. Even in relatively organized homes, items that don’t belong in the closet inevitably find their way there. Whether it’s hidden Hot Wheels jammed into your shoes or bags full of mystery items recently recovered from your car, items that don’t belong in your closet should be removed and returned to where they belong. Have you worn it in the past 18 months? Is it in your regular 20% rotation? Are you spending time every morning passing over these items of clothing? Remove them from your closet so you’re spending that time reading our blog instead. Would you buy it right now if it was an amazing deal? We’re all guilty of impulsively buying ugly clothing that was suddenly appealing after discovering that it was 80% off. Most of us choose clothes that make us look great. Looking great makes us confident. We also choose clothes that send a message. The clothes that make us look great and send the messages we want change, as our bodies and minds mature. Make sure each item has weathered these changes. Is it still on trend? This is last on the list because it’s better to not have to ask this question at all by investing in timeless items of clothing. More items and less outfits means you have to constantly declutter your closet. Capsule wardrobes are all the rage these days for good reason; they are always in style and can be combined in countless ways to make endless outfits. As you evaluate each item of clothing, decide whether you’re going to keep, donate, sell or recycle it. This is usually the most challenging task because of the sentimental and financial attachments you might have your clothing. Be honest. Be brutal. And if you’re a procrastinator by nature, be weary of adding too many things to the sell pile because you may never get around to selling them. Using black garbage bags might be helpful to declutter your closet and prevent dumpster diving as you see your favourite misshapen t-shirt on its way out the door. Ok, so you’ve answered “no” to all the evaluation questions above, but still can’t let go because of the amount of time or money you spent buying all your clothing. What now? Consider sending your clothes packing and taking a trial separation from them. Put all the items that you should part with but can’t, into a box. Store them for 6 months to a year and if you haven’t returned back to the box after all that time, donate the entire box of clothing without opening it. As you put your items back into your closet, help to create the appearance of a collection rather than clutter by grouping like items together. Shoes stored willy-nilly and jeans folded haphazardly in several places result in unappealing visual clutter. Installing storage solutions like shelving, drawers or even a complete closet organizer system can help provide permanent homes for items that are without. They can also help you to maximize the use of the space you have available in your closet. Once you’ve finished decluttering and organizing your closet, keep it that way. Put clothes back where they belong after trying them on or doing laundry. Instead of having to make major preparations to declutter your closet, maintain it every week. Finally, consider limiting the number of items of clothing you own. Going forward, donate or recycle one item for every new item you buy.